Sedona Stars – available on Ravelry. Inspired by the layers of rocks and the starry nights of Sedona this pattern is perfect for knitters of all skill levels. 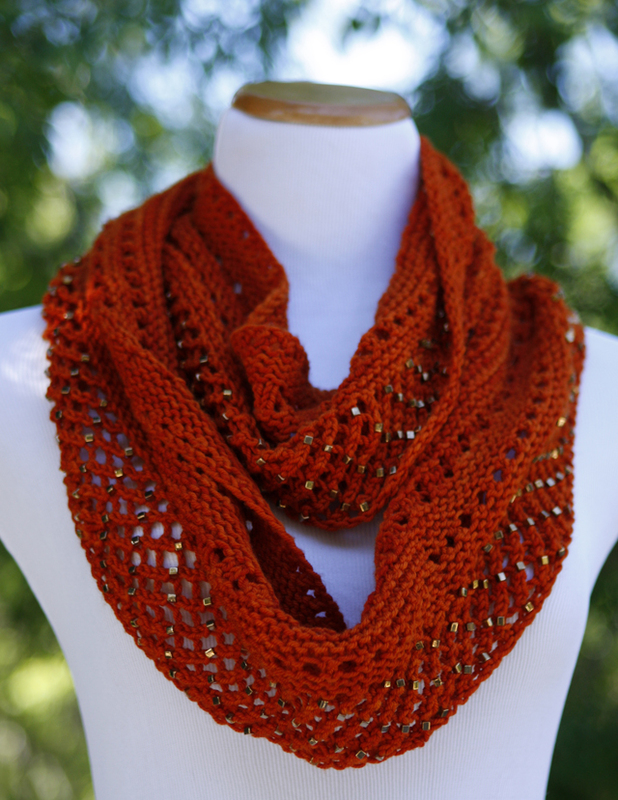 Knit in worsted weight yarn, this cowl knits up quickly – optional beads add a bit of sparkle. Our eldest daughter graduated from Northern Arizona University in Flagstaff and now makes her home there. I love to visit her, drive through the beautiful canyon, and hike around Sedona. The red rocks and azure sky are striking; the colors are so saturated they don’t look real. Two skeins of Orange Amber Baah Shasta and two tubes of 4mm square beads. Several years ago I spent a weekend in Sedona attending a workshop by Julia Cameron, author of The Artist Way. I stayed in a hotel up one of the hills and when I looked out from the balcony the sky was clear and stars sparkled above. The color of this yarn, Baah Shasta, reminded me of the rock formations in Sedona and I created this pattern that highlights the yarn. I combination of eyelet lace with stockinette and garter stitches reminds me of the rock layers in Sedona. The beads are optional but add a bit of fun sparkle. 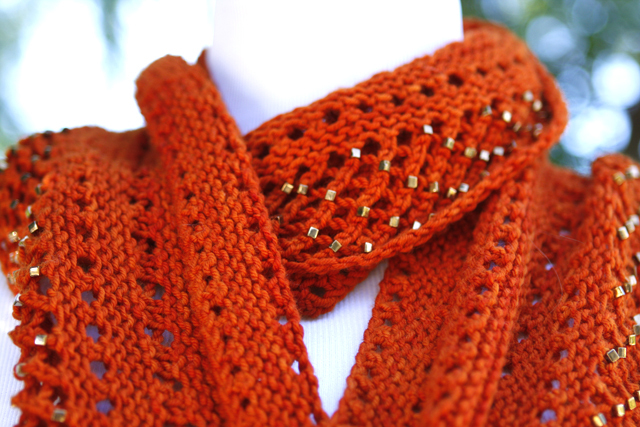 I chose simple brass beads to complement the Orange Amber colorway. 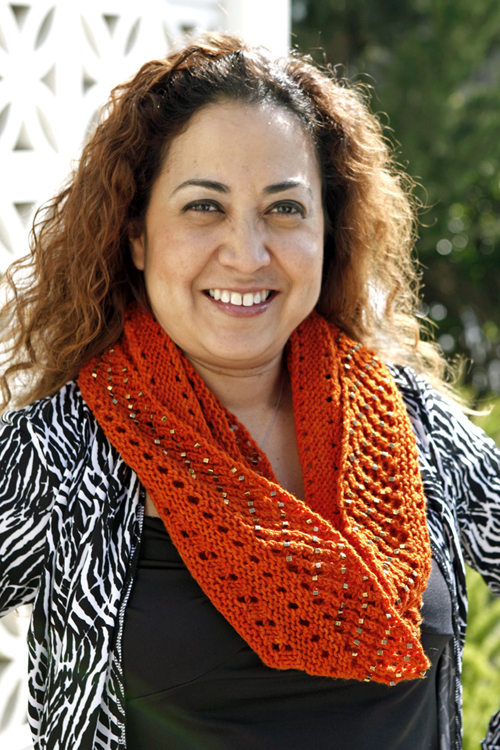 I plan on making another version using a bright color of Baah Sonoma yarn (DK weight) and bright contrasting beads. Don’t worry if you haven’t knit with beads. The Sedona Stars Cowl doesn’t require you to pre-string the beads; instead you place each bead on a stitch as per the pattern. See Laura Nelkin’s tutorial, “Placing Beads on Your Knitting: Video Tutorial” – she has some great tutorials on her blog. Please check the beads for the size of the hole before you purchase them to make sure they will fit on the yarn you choose. The pattern is available on my Ravelry Store. If you knit Sedona Stars, please post a photo on Ravelry as I love to see results of others who’ve knit my patterns. This entry was posted in family, knitting, lace, pattern writing, technique and tagged design, finished object, kathisdesigns.com, knitting, lace, pattern, ravelry. Bookmark the permalink.